Last night's "Clear" episode of The Walking Dead saw Rick, Michonne, and Carl travel back to Rick's hometown to stock up on weapons. While there, Rick ran into his old friend Morgan, who hasn't exactly had an easy time of things since Rick's been gone. The next episode of The Walking Dead is called "Arrow on the Doorpost," and AMC has released a series of three previews for the episode. Judging from the previews, it looks like Andrea might help to arrange a meeting between Rick and The Governor. Of course, it also appears as if The Governor doesn't plan on negotiating, as an angry Rick is seen yelling at Andrea, "You told me he was willing to talk." The Governor is also shown saying, "This fight, it will go down to the last man." 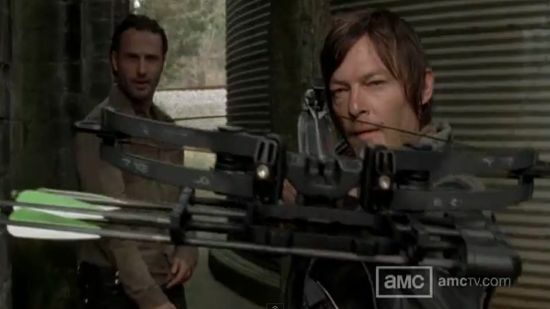 The "Arrow on the Doorpost" episode of The Walking Dead airs on Sunday, March 10 at 9 PM ET on AMC.